On February 28, the start-up activity of major projects in the first half of 2019 was held. Midea-KUKA Intelligent Manufacturing Science and Technology Park was unveiled since it started its construction last March. According to the report, the first phase of the project is expected to be put into operation in June this year. According to the plan, Midea-KUKA Intelligent Manufacturing Science and Technology Park will introduce 25 to 40 enterprises in the supply chain of the intelligent manufacturing industry, so as to enhance the overall competitiveness of the science and technology park and promote the development and upgrading of the intelligent manufacturing industry in Foshan and even in South China. 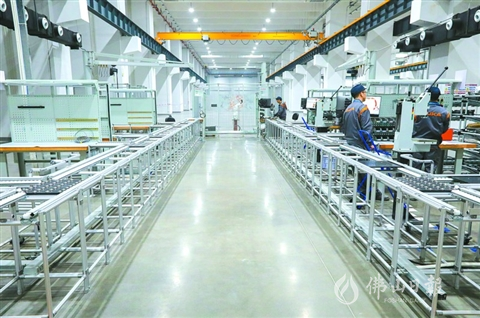 Midea-KUKA Intelligent Manufacturing Science and Technology Park is located in Beijiao, Shunde, and its foundation was laid on March 28 last year. The project is invested by Guangdong Midea Industry Technology Co Ltd. The project will cover four areas of intelligent manufacturing, intelligent logistics, intelligent medicine and smart home, which includes robot manufacturing center, research center, application demonstration center and South China regional headquarter. On the construction site last year, Paul Fang, Chairman and President of Midea Group said that the project is the result of the cooperation between Midea and KUKA, and it is a bridge connecting the leading enterprises of the German "Industry 4.0" and the advanced manufacturing industry in China. Midea and and KUKA will join hands in integrating the advantageous resources of both sides and make effort to exploit Chinese market. The project covers an area of 288,900 square meters, a construction area of 434,000 square meters and a total investment of 1.752 billion yuan. After putting into operation, the main products of the project include robots such as six-axis robot, SCARA, AGV, DELTA, LINEAR, supporting control system, servo motor, etc. The target of the park is to form a competitive full industrial chain of robot in the future. At present, Sino-German Industrial Service Zone in Foshan is further strengthening international cooperation, Foshan is making every effort to build Sanlong Bay high-end innovation cluster area, and Jihua Lab will also carry out related experimental projects for the robot industry. At the same time, Shunde is taking the lead in building a reform and innovation experimental area with high-quality development system and mechanism in Guangdong Province. A series of platforms and projects related to Midea-KUKA Intelligent Manufacturing Science and Technology Park are under construction. Foshan robot industry eco-system will be more perfect. Mo Wentao, the relevant person in charge of the Midea-KUKA Intelligent Manufacturing Science and Technology Park analyzes that Foshan is a well-known manufacturing city in China, and robots have been widely used in industrial development. But the density of Foshan robots is still lower than the international leading level. There is still great potential and space for its development. The project has the world-leading industrial robot R&D and manufacturing technology of KUKA. Meanwhile, with the unique supply chain and cost control system of Midea, the project will be able to provide customers with robot-based automation solution.